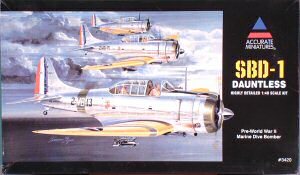 Douglas Aircraft Company developed the SBD Dauntless in a pre-war competition for the 'next generation' carrier dive bomber. 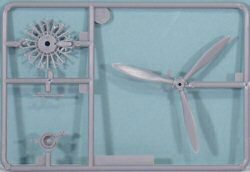 The aircraft was two-place monoplane of all-metal construction (except for the flight control surfaces) powered by the Wright R1820 radial engine. The SBD-1 entered production in 1940 armed with a pair of 50 caliber machine guns in the nose and a single rearward firing 30 caliber in the rear cockpit, as well as a centerline bomb station that used a trapeze mechanism to release the bomb safely beneath the propeller arc. Most of these aircraft were relegated to training duties by the time World War 2 began, replaced by later variants of the SBD in service. 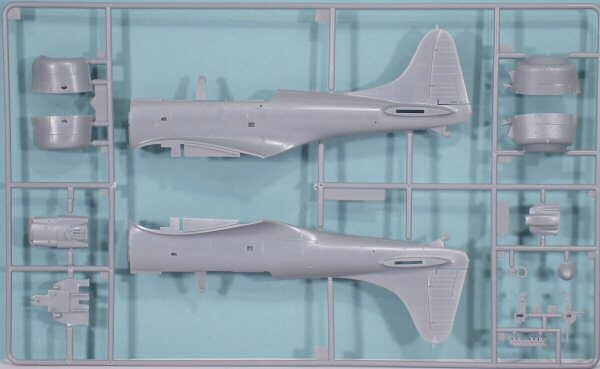 Accurate Miniatures continues to round out the SBD Dauntless series, with the venerable SBD-1 featured in this release. 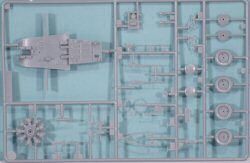 As with the previous kits in this series, the kit is molded in light gray styrene and its detail is still awesome to view. 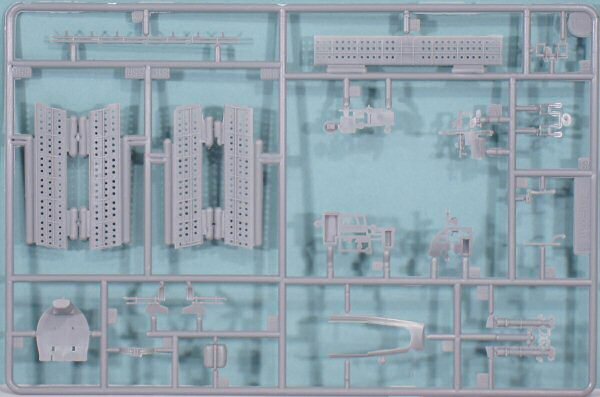 This kit is presented on six trees of gray parts, plus a single tree of clear parts. 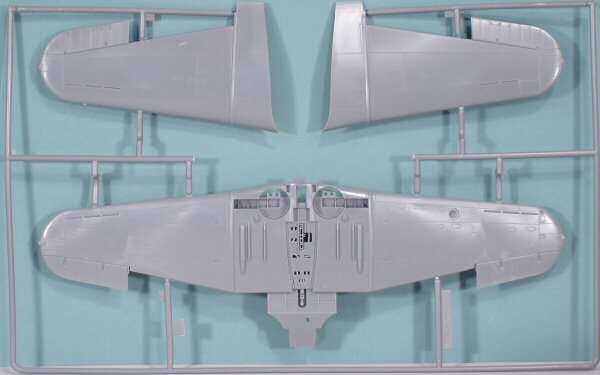 Comparing this kit to the SBDs of other manufacturers, the first place you'll look is at the dive brakes. With the others, these flaps are usually solid, or in one case, represented with photoetch. While photoetch is usually a good thing, especially for the perforated details, it lacks the ability to replicate the internal structure of the flaps. 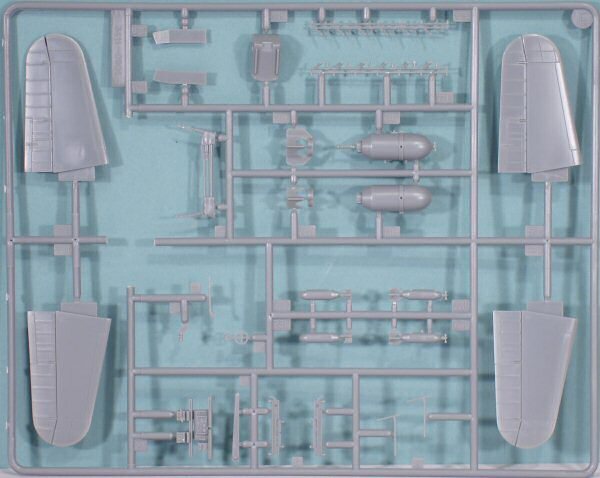 This kit's dive flaps/brakes are styrene, nicely perforated, and complete with all of the internal details. These internal details are especially visible after you paint the internal surfaces red. 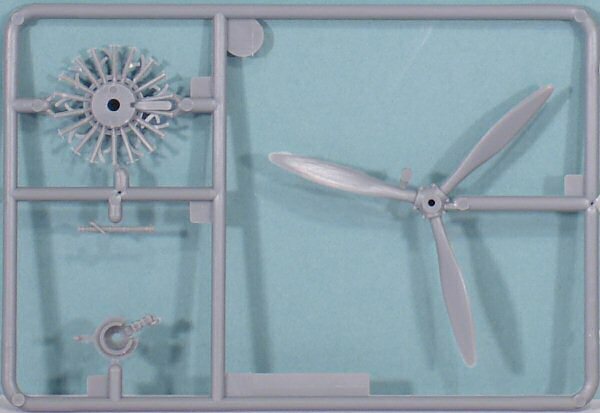 One of the most visible and important areas of any aircraft kit is the cockpit, and Accurate Miniatures doesn't fail here. 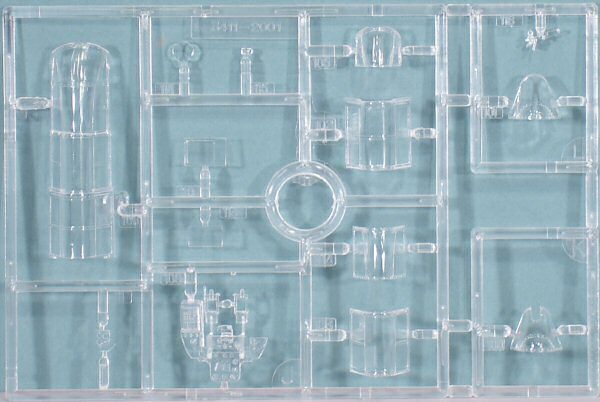 Where the other kits benefit from an aftermarket cockpit detail set, the Accurate Miniatures kit is far more detailed than most of the aftermarket sets I've seen for the SBD. Note how the cockpit floor rolls down at the front. This captures the look of the practice of mounting the cockpit atop the wing used on many low-wing aircraft of the day. 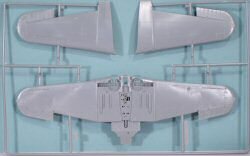 The cockpit floor also has integral main spars molded to it to assure a solid join of the wing and fuselage. 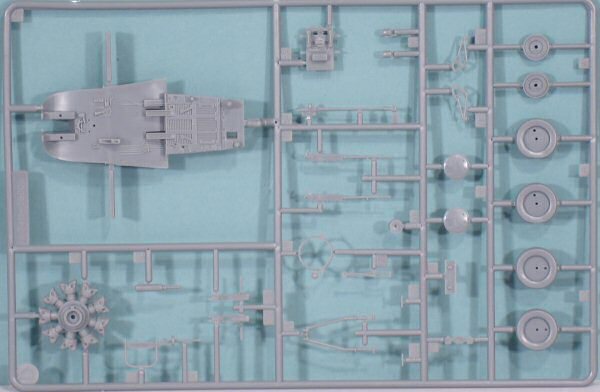 Another nice touch with this kit is your choice of two canopies - one closed up, and one forward canopy, center canopy, gunner's canopy and rear canopy all as separate parts. With either choice, the windscreen is a separate part. The kit offers your choice of round or weighted wheels. 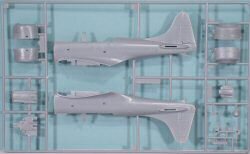 The dive brakes or just the lower flaps can be positioned out. 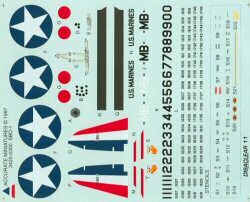 Markings are provided to replicate any of the USMC SBD-1 Dauntlesses of VMB-1 or VMB-2. The instructions show the proper bureau number for any of the 36 aircraft in those two squadrons. 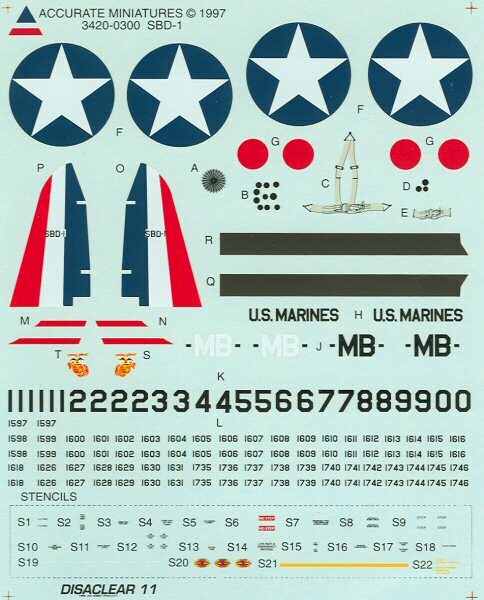 For information on the color identifications used in pre-war USN/USMC squadrons, click here. As with every other release from Accurate Miniatures, this kit is a beauty straight from the box and if you have one of the correct kits, this is a straightforward build. 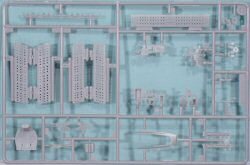 With all of the detail in this kit, less experienced modelers should study the instructions and take their time assembling the model. The results are worth it. 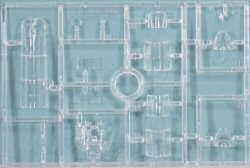 Thanks to Accurate Miniatures for this review sample!